This comes out so cute. Everyone who saw it, loved it. I made this many years ago. 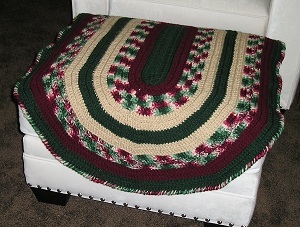 It had holly leaves on it, which I omitted, and I wanted it longer so I added a few extra rows. 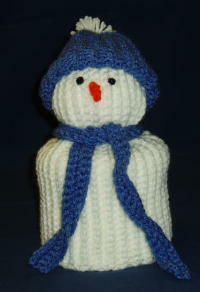 The pattern re-appeared in the Christmas Helps, 1989, issue. 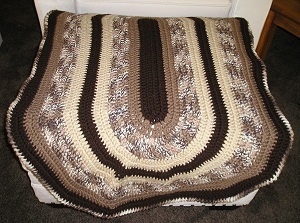 and the pattern had been changed from rows to crocheting in rounds. but I didn't finish it until after the first of the year. and I decided that the rug made the perfect cover for our light colored footstool. so I used the pattern to make a second rug in brown. and the brown one looks really nice with our new furniture.